In today's competitive market, boring resumes no longer make the cut. Especially for creative industries such as graphic design, architecture, advertising, and photography, employers appreciate a document that has something more than your professional qualifications listed in black and white. This might seem like a daunting task for jobhunters with busy schedules. After all, you have limited time in the day to experiment with color, font, layout, and imagery. Our free modern resume templates eliminate some of the headache. We understand what it takes to craft a stand-out resume and incorporate all the features in an innovative program. Simply choose a design – we have hundreds – from our library and begin to fill out your skills, work history, and experiences. All the technicalities are automatically adjusted so you can have a document that's detailed, bold, and unique. 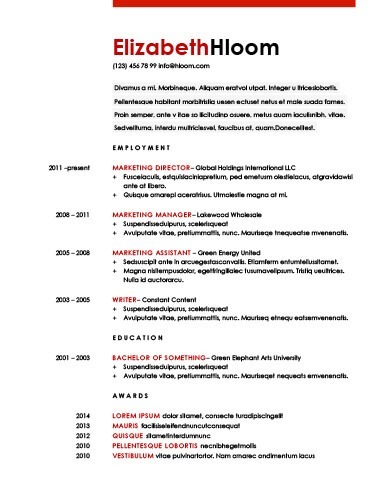 Why Use Free Modern Resume Templates? Experts commonly cite traits such as passion, teamwork abilities, and positivity as desirable in employees. A resume reflecting the company’s brand and mission shows you did your research on the open position and can contribute a strong set of assets. With our guidance, you can boost your confidence and become more sought-after in less time than attempting it on your own. Top-tier positions such as president of an organization might require a two-page resume listing over five years of esteemed qualifications. Space out your best attributes in an eye-catching format that won't bog down your document or leave too much blank space. Our two-page free modern resume templates help you seamlessly frame your accomplishments with creative elements you can customize to your liking. A resume is often the first step of a job application. The second step might call for a cover letter that expands on the experiences listed in your document. With full paragraphs rather than bullet points, a cover letter certainly can be intimidating, but it's an essential document to master. Our resume builder includes a cover letter builder to give you valuable pointers. Congratulations on finishing school! Tell employers you're in the know about work expectations by using our free modern resume templates created for a new generation of jobhunters. Your degrees and certifications will shine through, and we'll make sure to hide the fact that you have limited industry experience with our nifty white space tricks. The result will be a streamlined document with a refreshing burst of creativity. Many companies use applicant tracking systems to pick out resumes that meet requirements for a position. What do you do if you're changing careers from an unrelated field? Our ATS–enhanced free modern resume templateswith a clean layout free of red flags such as graphics or unusual fonts solve that conundrum. Professional email address: Avoid "cutesy" email addresses and list one that uses a variant of your name. Also, steer clear of dated domains such as AOL or Hotmail. Mailing address: Include only your city and state to avoid identity theft ~ Most jobseekers are ditching the traditional objective statement on their resumes in favor of the summary statement, but some job hunting professionals can leverage objective statements for their benefit. The key is determining which version better suits your purpose. Summary Statement: Think of the summary statement as your "quick elevator pitch" that stresses your critical hard and soft skills related to the position. To demonstrate how you’ll bring value to a future employer, be sure to include keywords from the job description that match your own experience and abilities. Action Verbs: Employ dynamic words that give recruiters a picture of what you’ve done. If you need inspiration, try The Muse’s comprehensive list of powerful verbs. ~ Be Selective: Don’t worry about listing your GPA. In most cases, it’s only a bonus if you earned a 3.5 or higher and you’re seeking internships. If you receive an interview offer, hiring managers often pull out your resume to reference as they're getting to know you. You must be able to expand upon your information convincingly, since what you say may follow you through the course of your career. Before submitting your document, proofread it carefully. We’ve compiled a handy checklist to use with our free modern resume templates, so you can be certain you completed all the steps to make your document as perfect as possible. Name: Put your full name in the header of your document. 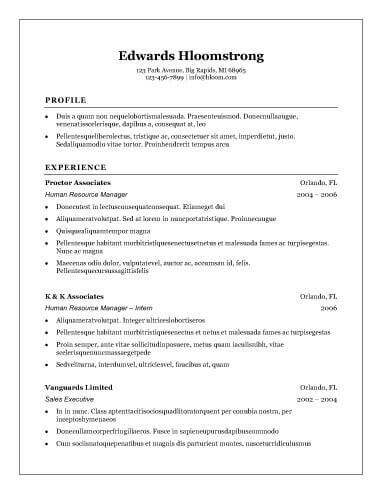 To make it extra noticeable, consider increasing the font a bit, underlining it, or using a different font style than the rest of your resume. Phone Number: Include your cell or home phone number. Avoid the work number of your current position. Email Address: Maintain a professional reputation by using an email address that includes your full name. Only use something like [email protected] outside work. Summary: This is a concise elevator pitch of your best qualities as they relate to the position. Read the job description closely; you may pull language and copy it exactly to make a better impression. Objective: An objective statement describes why you want the job rather than what you can offer and is considered outdated by most employers; however, entry-level or part-time candidates may find it useful in some cases. Prioritize: It's tempting to make a long list of everything you know how to do. However, this section only needs between six and eight skills. Personalize: Echo the language of the job description. For example, if the position requires "strong multitasking skills," put that rather than "excellent multitasking skills." Mix It Up: Add both hard and soft skills to show you're well-rounded. Essential Information: Most employers consider a resume incomplete without the following: name of past employers, your official title, location of employment, and dates you worked. Bullet Points: Compile between three and five bullet points for each position. Be as specific as possible by including stats, numbers, and names of awards. Language: Use strong action verbs such as "executed," "achieved," and "streamlined" rather than "handled" or "looked after." Accreditations: List the names of the institutions you attended, location, and official name of degrees or certifications. Jobhunters who aren't recent graduates don't need to put the year they received their accreditations. Memberships: If you wish, you can include the name of sororities, fraternities, and professional organizations you're involved in. Keep in mind that while our platform arranges your information in a pleasing layout and gives you valuable industry-tailored writing tips, it's ultimately up to you to make sure your language doesn't sound overly canned or insincere. Whether you bring your first draft to edit with the guidance of experts or use it to make initial ideas bloom, making your document the best it can be still requires brainstorming and careful thinking. However, with our approach, jobhunters have found jobs 33% faster than individuals who didn't reference our treasure trove of advice and writing samples. Our pros have put forth a lot of effort ensuring that our free modern resume templates are cutting-edge enough for the current market. Check us out today to see what we have to offer!